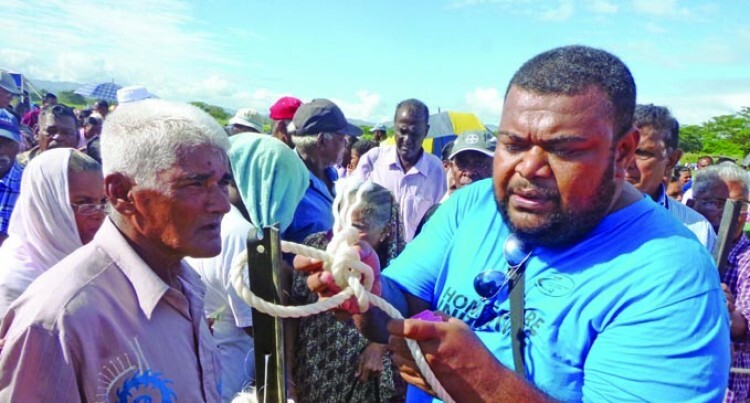 Home-CARE Initiative team Ba personnel Buatavatava Nauluma­tua escorts elderly Ba residents past the rope at the Ba Market Grounds on May 25, 2018. As human beings we are created with the ability to distinguish right from wrong. But sometimes our judgement can be clouded as a result of vari­ous factors – peer pressure is one. It also takes pressure to admit a mistake. For the 23 individuals we’ve reported today who have returned their MPaisa Cards Homes-CARE Initiative as­sistance, your conscience certainly got the better of you. You finally came to the realisation that you were not ‘directly impacted’ by Tropical Cyclones Josie and Keni. You are one of the lucky ones. Now for those who may have missed the memo and are trying to beat the system, here it is again. If you were not affected by TC Josie or TC Keni, but have already applied and received assistance under the CARE for Fiji programmes, you will be granted amnesty until Sunday, May 27, 2018. Return the electronic cards, or any other form of as­sistance received to Government officials. The amnesty period applies for all ineligible recipients under the Farms-CARE, Homes-CARE, eTransport-CARE, Leaseholders-CARE and Sugarcane-CARE. Government has outlined that during this amnesty pe­riod, ineligible recipients who have already used up the allocated amount in the electronic cards must ensure it is repaid in full. Audit teams are already doing random verifications and spot checks for households and individuals. Several cases of suspected abuse have already been referred to the Fiji Police Force for investigation. Your conscience will certainly remind you about whether you were ‘directly impacted’ or not. So far the total assistance provided under CARE for Fiji stands at $55.3 million. If the above memo is not enough, here is another re­minder. Under the False Information Act 2016, any false infor­mation given to Government for the purposes of receiv­ing a benefit is an offence punishable by law, and may result in a requirement to repay the benefit, a fine of up to $20,000 or an imprisonment term of up to 10 years or any or all of the foregoing. If the warning of a hefty fine or imprisonment is still not enough, than those who know they are ineligible, but applied and received the assistance anyway deserve what they get if they are caught. There are Fijians who genuinely need the CARE assis­tance. They deserve all the help they can get – not only from Government, but from fellow Fijians as well. The human conscience is a powerful weapon – maybe the only one against such greed and abuse of the CARE initiative.